Jebao UIF2000 Internal All IN ONE Fish Pond Filter With UVC | Fountain City Art Ctr. The UIF-2000 has both mechanical and biological filtration, sponge media removes the larger solid particle before water goes through the plastic media and bio rock for the biological stage of filtration. How does it work? Stage 1 - Mechanical Filtration Pond water is pumped into the filter to begin the mechanical filtration stage, this stage uses two special designed foam sponge to effectively remove all sizes of unwanted debris. Stage 2 - Biological Filtration This stage uses bio-rocks providing a habitat for beneficial bacteria to grow. These bacteria naturally convert harmful ammonia and other wastes into healthy nitrates that fertilize aquatic plants and support a healthy pond environment. Stage 3 - UV Filtration The final filtering stage uses a low voltage, Ultra-Violet(UV) light, Exposure to the UV light kills algae as the water passes through the filter on its way back to your pond. The pump has a 1 year warranty. The filter has a 6 month warranty. 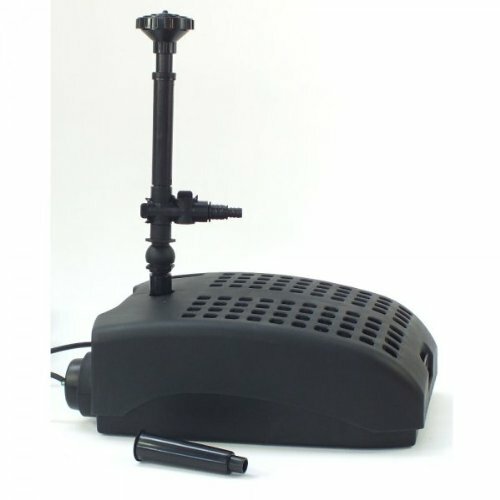 12V, 9W subersible safety UV-C.
Fountain device with multi spraying patterns of fountain nozzles. High quality filtrate material.